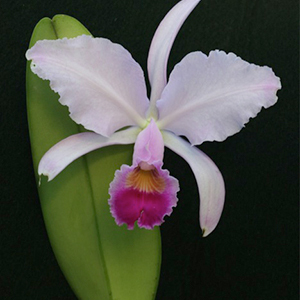 This beautiful orchid is not only beautiful, but is endangered in the wild because of habitat destruction. It is also the national flower of Columbia, where it grows in the mountain cloud forests at up to 2000 metres. The flowers vary in colour from white to deep purple and can be up to 20 cm across. Like most orchids Cattleyas are epiphytes; they grow on tree branches for support and get their nutrients from decomposing leaf litter from the canopy above. See it in flower in the Orchid Case in our Subtropical House.